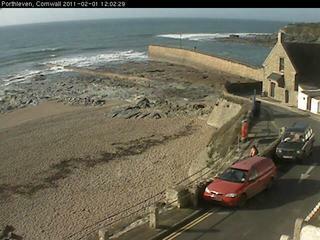 Webcam Porthleven: Beachview - A view of the beach of Porthleven, with current weather data. Stithians Lake: Lake View, 8.5 mi. Carbis Bay: Carbis Bay Beach, 10 mi. Newlyn: Port of Newlyn, 10.2 mi. Newlyn: Newlyn Harbour, 10.3 mi. St Ives (Cornwall): Porthminster Beach, 11 mi. St Ives (Cornwall): HD Stream Harbour, 11.4 mi. St Ives (Cornwall): Porthmeor Beach, 11.6 mi. Porthcurno: The Minack Theatre, 15.2 mi. This webcam Porthleven with the theme Beaches was added on February 24, 2011 and is operated by Creations Art and Crafts Materials Online Experience. It got 11824 visitors since then. Shouldn't this webcam work or should the link be wrong please report that here. You can add this webcam here to myCams.